"Conditioning To The Core" is a comprehensive resource that provides more ways to strengthen and train your core than you can imagine! • Recommended for: Athletic trainers and competitive athletes. Serious weekend warriors may also find this book useful. • Greg Brittenham served as assistant coach for player development and team conditioning with the New York Knicks for 20 years before taking the position of director of athletic performance for men's and women's basketball at Wake Forest University in 2011. He was also the director of the Center for Athletic Performance at the National Institute for Fitness and Sport. • Daniel Taylor, MS, PES, CSCS is the head strength and conditioning coach at Siena College and oversees those efforts for all 18 Division-I varsity programs at the college. He has trained athletes who have advanced to the professional level in baseball, basketball, lacrosse and soccer. Taylor previously worked with the New York Knicks training camps. This book does not contain an Index. PART I contains 5 chapters. In the Intro, the authors state an important concept regarding core training: "Stability precedes strength, and strength comes before power." Chapter 1 further justifies the importance of core strength in sports performance. Chapter 2 focuses on anatomy. This chapter is most appropriate for athletic trainers, or college students studying sports training; it is going to be way over the head of the average weekend warrior. Chapters 3 and 4 provide good info, but, again, this exercise physiology content is too sophisticated for the average weekend warrior. Chapter 5 explains the conceptual framework for the book's exercises. In this chapter, the authors present their master list of "benefits," which I comment on below. PARTS II (80 pages), III (150 pages), and IV (39 pages) present the specific exercises. Obviously, there is a lot of content here. For each exercise, there are images, a description, and numerical footnotes that refer the reader back to the master list of benefits in Chapter 5. PART V (50 pages) covers testing, and provides training programs for specific sports. The programs are detailed and explicit. • Photos & Illustrations: There are a ton of color photos in this book. In general, these enhance the usefulness of this book. However, many of the exercises show only 1 image. Sometimes, there is uncertainty regarding what the movement should be. For example, the "Elbow Bodysaw" on p. 148: I had to read the description of this exercise several times before I figured out that the motion involves moving back and forth from a totally flat (horizontal) body position to a kneeling position. • Tables & Graphs: There are a handful of tables throughout this book; generally, these are concise and clear. No graphs appear. • Documentation / Accuracy: This is not a scientific book, so, it does not cite published research throughout. However, considering how many exercises are based on the plank in this book, I was hoping the authors did include a reference list at the end. What I Liked About This Book: One of the strengths of this book is the total number of exercises. I didn't count them, but it states on the front cover that it contains over 300 exercises. 1) The Benefits List: In chapter 5, on p. 38-43, the authors provide a reference list of 24 "benefits." Then, for each exercise in the book, they identify the specific benefits of that exercise by listing a series of numbers. These refer the reader back to this master list in chapter 5. However, while some of the concepts on the master list are benefits, others are what I would label as "descriptions" or "actions"....ie., they are not really a "benefit," per se. For example, #6 on the master list is "Suspension." That's not a benefit. In the description for this, the authors state: "Suspension training will challenge stability, strength, kinesthesis, and proprioception." It seems to me that these are the "benefits." However, "improved proprioception", for example, is not one of the 24 benefits on this list. I think this master list in Chapter 5 should be extensively revised to itemize only benefits. This would also shorten this list. Limiting the list to only benefits, and, making it shorter, would both improve the comprehension of the exercises and the book overall. 2) Images: In general, the images are well done and useful. However, as noted above, providing only 1 image for a given exercise sometimes leads to uncertainty. This is resolved by carefully reading the description, but, why not avoid confusion in the first place by including a series of images and/or some directional arrows? 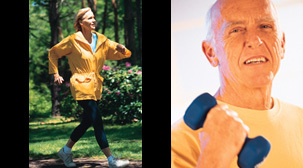 Also, include images of older adults, and, compose a chapter discussing core training as it applies to older subjects. This book is one of the most comprehensive, if not THE most comprehensive, resources on training the core that I have seen. It is absolutely loaded with color images of athletes demonstrating a wide variety of specific technics. In fact, at nearly 400 pages, and with "over 300 exercises," and the inclusion of academically-flavored content (chapters 2-4), this book might be too much for the average weekend warrior. 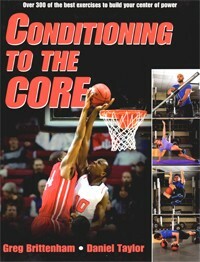 In summary, Conditioning To The Core is well done and is a useful book. The strength of this book is the quantity of color photos of people demonstrating each exercise. Some sections (eg., the chapters on anatomy and sports medicine) will be too academic for a general audience. This material suggests this book is more suited for college students studying sports training, or, athletic trainers. Still, some weekend warriors will find this book useful. Aside from my concerns noted above, I can recommend it for weekend warriors and any others who want to begin a dedicated core-training program. Athletic Abs (2003), Cole S, Seabourne T.
Developing the Core (2014), Willardson JM, et al.